Everyone knows that homesteading if full of ups and downs. So is life for that matter. When it comes to growing food and maintaining animals on the homestead there is only so much we can do. Although we wish that was not the case, some elements are simply out of our control. This year I had a great first season with my bees. We extracted about twenty pounds of honey at the end of August. They were a very busy bunch and have done so well this year. Sir Swine has even taken a shine to watching them fly about doing their own thing. And happily no stinging! Sunday I gathered my energy, I have been very ill, and went out to feed my bees. 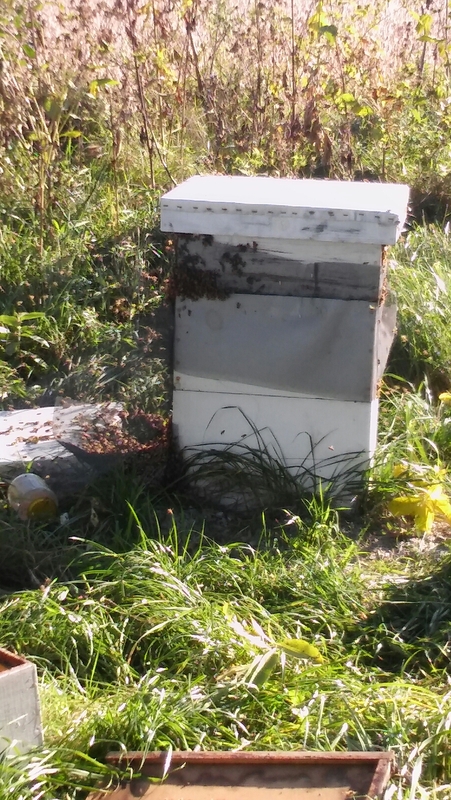 The nectar flow for the season has ended and to ensure a good group of brood for winter you need to feed your bees. This is the job of a good beekeeper, which I hope to be. Upon arriving at the hive I was shocked and devastated. Where my hive normally can be found calm with moderate activity of my bees coming and going instead I found a frenzy of bees. Many of these bees were fighting, and honey bees fight to the end to protect their years hard work. I knew instantly that these were not my bees. We were being robbed! Tag Along had followed me part way and I yelled for him to go get Dad. After many different attempts to rid the hive of the robber bees (no we did not open up the hive and please know you should NEVER do that when other bees are present it makes for an easy entance) we finally decided to ruin an extra screen for a window. Sir Swine went in with the screen cut into various pieces and a stapler and did his best to seal up every crack, crevice and of course the entrance. With thousands of unwanted guests buzzing around the hive there was nothing more we could do. Robbing bees flying around and trying to get into the hive. Early this morning, long before the bees begin their day, Sir Swine went out with a flashlight to look inside our hive. The damage has been done. He found only a small cluster of bees in the upper box all on one frame. This gives me hope that the queen is still alive but I worry the numbers are to low with winter approaching so quickly. We will be doing everything we can to help them along but the final outcome is really out of our control. So sorry about your hive. We lost both of our hives this year and while it was such a let down, if there’s anything that I’ve learned from homesteading, it’s that each day brings a fresh opportunity to try again. So sorry for the terrible invasion! I hope the hive will flourish once more!